Located in the middle of the United States, Nebraska is home to small towns and vast stretches of farmland, but that doesn’t mean there isn’t a lot happening. From the beginnings of Arbor Day to the invention of Kool-Aid and Runza, Nebraska is home to many unusual inventions and historically significant moments that you might not have ever heard about. Here are 15 fun facts about Nebraska you should know. In 1927, the ever-popular juice drink Kool-Aid was invented by Edwin Perkins in Hastings, Nebraska. Perkins transformed his soft drink syrup “Fruit Smack” into the famous Kool-Aid powder, making for an easier shipping process. The Henry Doorly Zoo in Omaha, Nebraska, houses the largest indoor rainforest in the United States. The Lied Lunge, covering 1.5 acres of land with an eight-story building, features flora, fauna and animals from rainforests all over the globe. 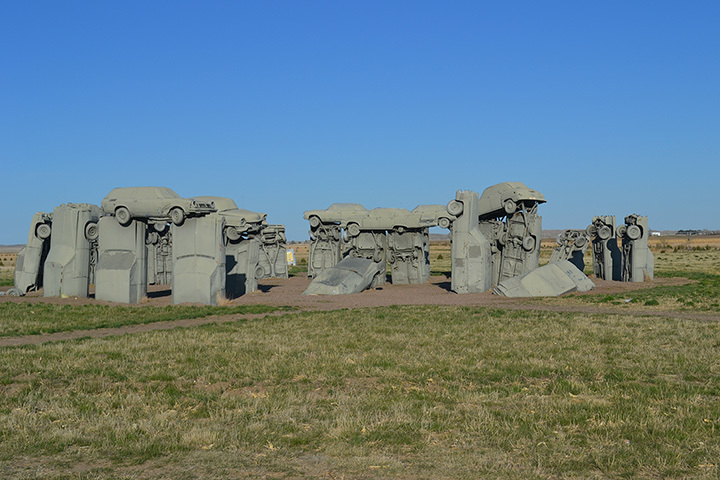 The Carhenge, a replica of the historic English Stonehenge, is located just north of Alliance, Nebraska and is made up of 38 old automobiles that have been arranged in the same proportions and shape as the original Stonehenge. The state of Nebraska is nowhere near an ocean. However, there is a lighthouse that stands along the road in Ashland, Nebraska. The lighthouse was constructed over 75 years ago and graces a 40-acre lake nearby. The name “Nebraska” originated with the Otoe Indians. The word “Nebraska” means “flat water” and refers to the Platte River that flows throughout the state. Nebraska is where “Arbor Day” first began. In 1872, Julius Sterling Morton proposed the holiday to plant trees on April 10 of that year and to award prizes to the counties and individuals who planted the most trees on that day. Roughly one million trees were planted in Nebraska on the first Arbor Day. Therefore, in 1885 Arbor Day became a legal holiday in Nebraska and it was moved to April 22, the birthday of Julius Sterling Morton. Omaha, Nebraska, is home to one of the most famous billionaires in the world, Warren Buffett. Buffett, also known as the “Wizard of Omaha” or “Oracle of Omaha,” still lives humbly in the city in his lifelong home. The Elephant Hall at the University of Nebraska State Museum features the largest mammoth fossil on display anywhere in the world. The fossils were discovered in Lincoln County in 1922 and have been identified as the remains of a Columbian mammoth. Bonus fun fact: It is also Nebraska’s official state fossil. Speaking of Lincoln, Nebraska, the Nebraska Cornhuskers’ football stadium is capable of holding more than 90,000 people. On game day, the stadium becomes the 3rd most populated place in the state! Nebraska is home to “Runza,” a fast food chain that dishes out hot stuffed pastries that are beloved by Nebraskans and almost exclusively found in the state. And even though you can find 82 Runza restaurants sprinkled across Nebraska, it’s highly unlikely you’ll find someone outside of the state that has tried one! In the late 1800s, a law created in Lehigh, Nebraska forbid merchants from selling donut holes. One lawmaker claimed donut holes were a waste and believed that by selling the middle of the donut bakers were trying to make an undue profit. Thankfully, the law was repealed in the late 1990s, but these tasty round treats are still hard to come by in the town of Lehigh. In Omaha, Nebraska you can find a six-foot-tall statue of the famous Chef Boyardee. Yes, the friendly face who graces the cans of Spaghetti-Os. And yes, he was a real person. Omaha is the former home of ConAgra Foods, Inc., which includes the Chef Boyardee brand. Nebraska is located in the bottom third of the country’s most populated states. With a total population of about 1.8 million people and most of its residents living in rural communities, it is also one of the least densely populated states. Nebraska may be one of the least populated states, but many celebrities call the Cornhusker state home. Fred Astaire, Marlon Brando, Gerald Ford, and Nick Nolte are some of the state’s most famous residents. The University of Nebraska in Lincoln is home to the largest weight room in the United States. In fact, it covers a whopping 3/4 of an acre meaning there’s plenty of space for the entire football team to get a proper workout.